In the beginning of last December, while I was looking into some opportunities to make the relatively slower month a little busier, the opportunities came knocking! One of the most interesting one was an email I received from Istanbul, Turkey. 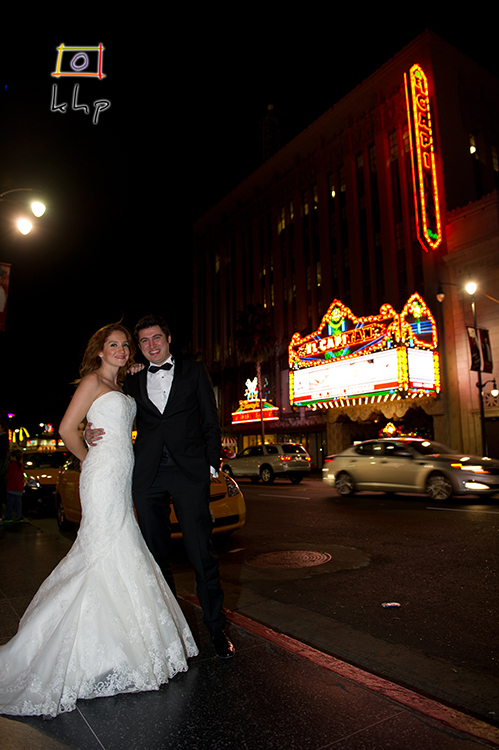 A bride-to-be (Lale) was very excited to have found an established Turkish photographer in Los Angeles as she was planning to wed her fiancé (Yusuf) in Los Angeles. I will not get into the technicalities why they were doing it initially in Los Angeles privately, but they had a "cute" reason. 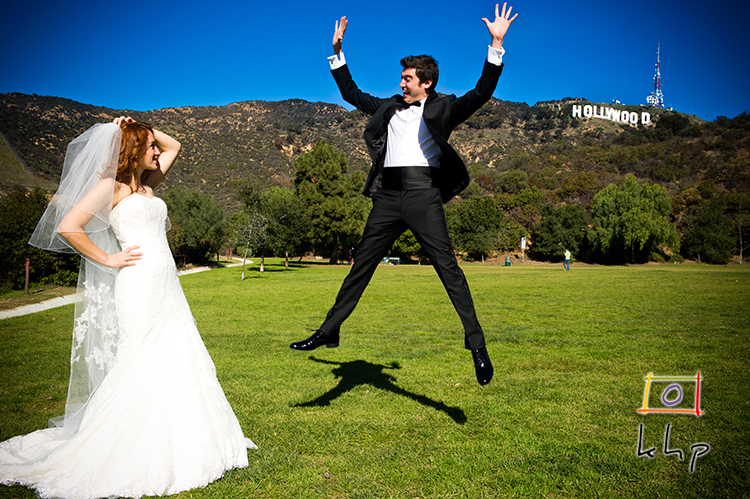 Sometimes, during the engagement sessions, the couples start a bit timidly. 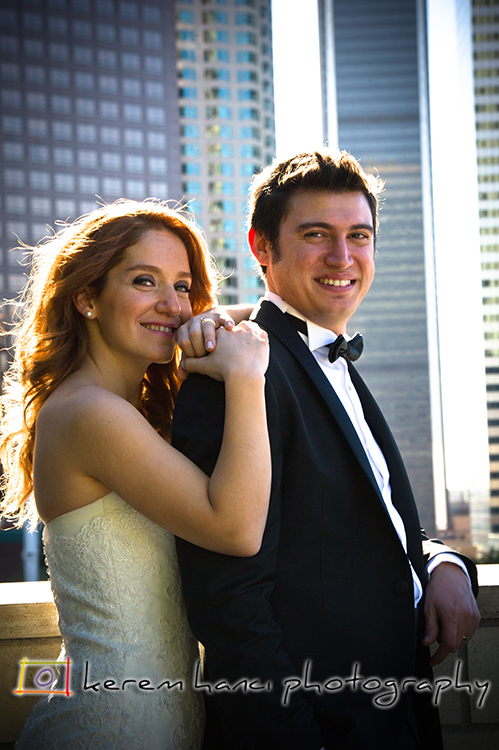 There may be some shy moments, some stiffness... All those are completely normal and as a photographer, it is my pleasure and my duty to put that couple at ease and get them rolling and start having fun as soon as possible. 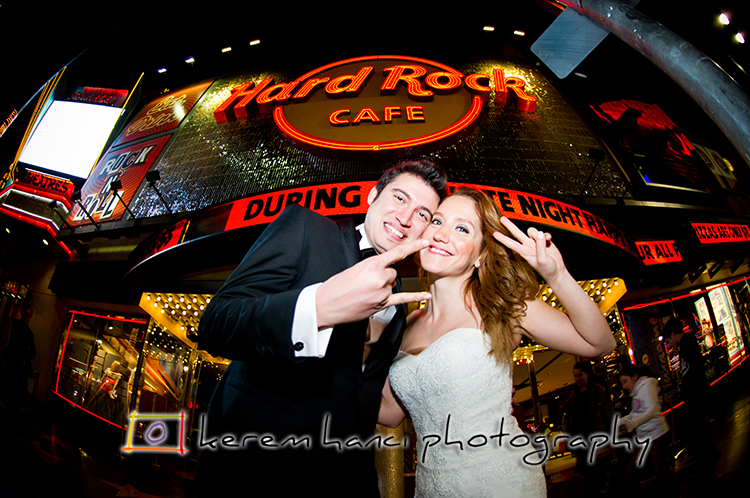 Although I usually have no particular problem with such a task, Yusuf and Lale were both ready to go! I found out Yusuf loves to be goofy, they both have wonderful humor and from the start, the day was promising to be fun. 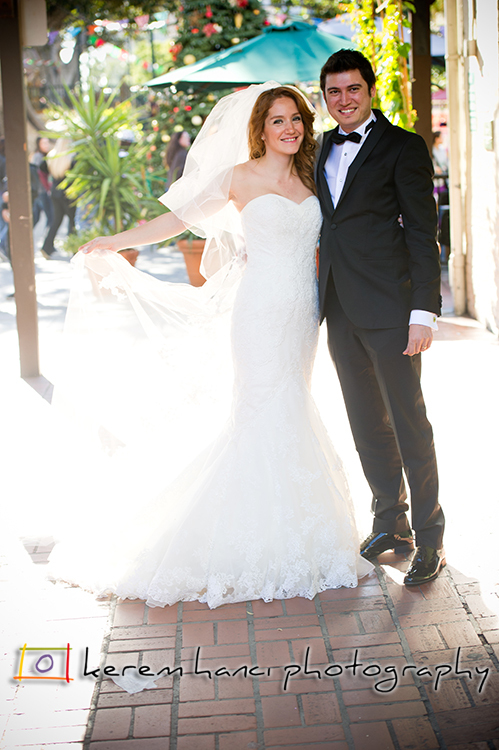 From Hollywood, we headed to Downtown Los Angeles... We first shot a few frames at the historic Olvera Street. 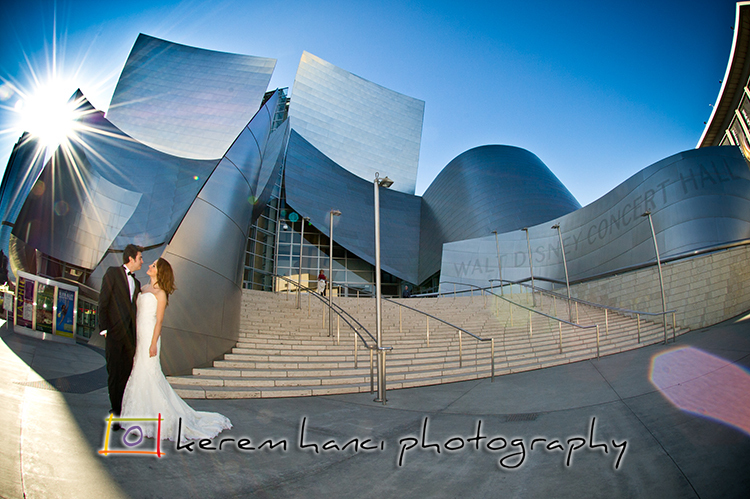 This one is definitely one of my favorite shots from the day... Walt Disney Concert Hall and its surroundings are absolutely wonderful. So many different opportunities and setups! I do have an obsession for fish-eye and I am proud of it! Downtown behind and a whole life together in front of them, the couple smiles. Following the downtown, we took the 10 freeway, which was, by the way, extremely nice to us and headed to Santa Monica. This popular spot provided us many different opportunities, and a few samples are below. Lale & Yusuf in front of the Route 66 Souvenir Shop. 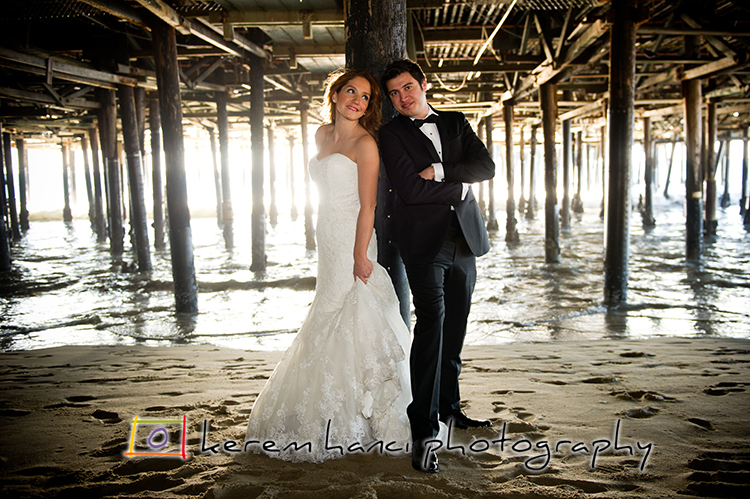 If you are a photographer, you gotta love to shoot under the Santa Monica Pier! Can you see the heart ? 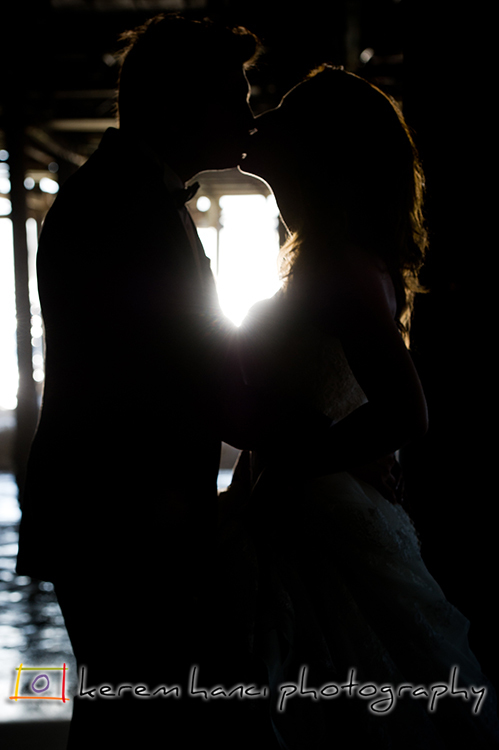 A silhouette shot that reminds me of the old westerns for some reason! The golden rays of setting sun over the Pacific Ocean, a delicious seafood meal, beer... Here's to the many years ahead of you guys! We were headed back to Hollywood, than I saw the Sunset on my rear-view mirror. Inevitably, we stopped. 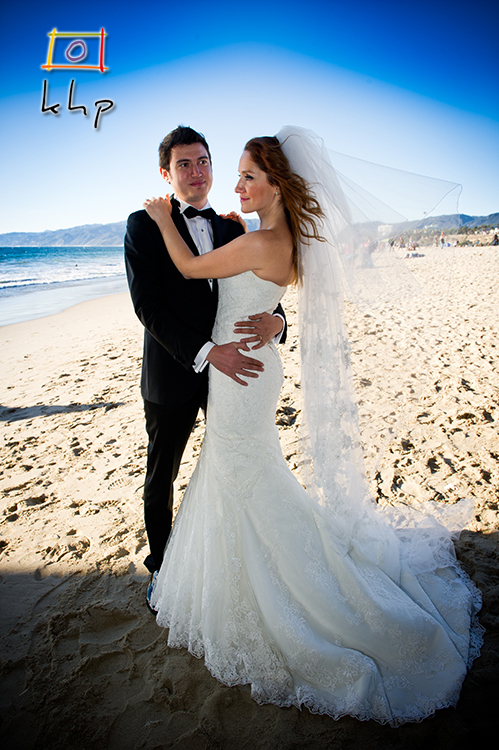 This was the Los Angeles Story of Lale and Yusuf! 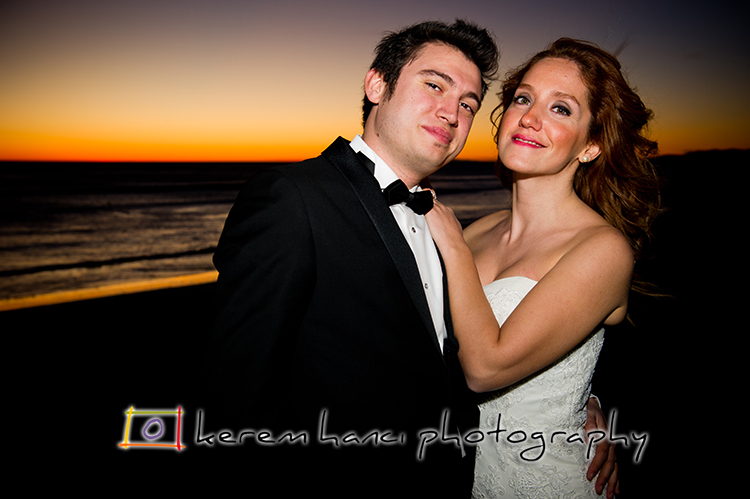 If you would like to organize a travelling shoot in and around Los Angeles, please feel free to contact me. I look forward to spend some more time with you next week!